Dan Seals, who was England Dan in the pop duo England Dan and John Ford Coley and later had a successful country career, has died of complications from cancer. He was 61. With England Dan and John Ford Coley, Seals had hits including "I'd Really Like to See You Tonight" and "Nights Are Forever," both in 1976. His country hits in the '80s and '90s included "Bop", "Everything That Glitters (is not Gold)", "You Still Move Me," "Love on Arrival," and a duet with Marie Osmond, "Meet Me in Montana." Funk icons Tower of Power, known for taking left turns musically, have taken a bit of a detour and recorded a collection of classic soul tunes that they have entitled the "Great American Soulbook". Included in their latest release are a dozen Soul Essentials, some utilizing original style arrangements, some with a TOP twist, but all with the distinctive Tower of Power sound. The CD consists of 9 songs produced by Emilio Castillo, Tower of Power's founder and leader since 1968. Three additional songs were produced by multiple Grammy award recipient, George Duke. The CD explodes with the first track, "You Met Your Match", a Stevie Wonder song masterfully handled by Tower of Power's dynamic lead vocalist Larry Braggs. Track 2, Sam and Dave's "I Thank You", features Tom Jones and Larry in a great rendition of a true soul classic that has stood the test of time with the Tower of Power Horns taking the song to a new level. Further into the CD Joss Stone joins the party offering up two fine vocal collaborations with Larry Braggs. Joss appears on track 4, "It Takes Two", and track 10, "(Heaven Must Have Sent) Your Precious Love". Sam Moore, who recently appeared at the Fillmore Auditorium with Tower of Power at their 40th Anniversary show, shines on track 7, "Mr. Pitiful". He brought down the house in San Francisco and his version of "Mr. Pitiful" will bring a smile to the face of anyone who enjoys soul music. Huey Lewis has been a close friend and a huge fan of Tower of Power throughout his career. On "634-5789" Huey delivers a rock solid soulful performance in a duet with Larry Larry Braggs, familiar to Tower of Power fans worldwide, serves up incredible vocal performances on "Loveland", "Me and Mrs. Jones", "Heaven Must Be Missing An Angel", and "Who Is He And What Is He To You". Chris Laterzo & Buffalo Robe "Jupiter & Pinon"
January 2009 brings the latest album by Chris Laterzo "Juniper and Pinon". Basic tracks for the album were recorded at Sonora Studio in Glendale, California with overdubs being recorded in a variety of locations. “Many of the vocal tracks, including two solo acoustic numbers, were recorded over two days in a suite at The Joshua Tree Inn. For bass and drums on ‘Hacienda’ and ‘Senorita Sunshine’ we returned to Joshua Tree, California where we rented a house and set up all the recording gear. The high desert offered an ideal setting for making this record, and we were able to capture some great moments.” Laterzo said. Co-produced by Laterzo and Jeff LeGore, Juniper and Pinon consists of nine Laterzo compositions and an alt-country version of Elton John’s ‘Holiday Inn’. The album features Laterzo with his band Buffalo Robe, and includes several solo acoustic numbers as well. Some highlights include the electric guitar driven ‘Misfit Child’, the breezy pedal steel laced title track ‘Juniper and Pinon’, and the ballad ‘Woman’. Dennis Kolen "Hard road/Muddy track"
One of the best and most productive singer-songwriters from Holland has just released his new album. In the last five years Dennis Kolen put a new record on the market every single year, among which his two solo albums: the highly acclaimed “The Jinx” (2005), recommended by Dutch pop guru Leo Blokhuis, and the beautiful “Wild Oats” (2007). Now, a year later, he brings us “Hard Road/Muddy Track”. Three years later Wyatt signed with major label Warner, who released the record “The Last Of Great Fireworks” (2004). After the creation of the third album “Miracle” (2006) the band fell apart and Dennis decided to continue as a solo artist. “Hard Road/Muddy Track”, is an album that, as the title suggests, has its roots in Americana. Influences like Paul Simon, Neil Young & Crazy Horse, Bob Dylan & The Band, and The Rolling Stones during the period of “Exile” are clearly recognizable. Still, the new album remains a pop album with melodies that are authentic to Dennis, and which remind one of The Beach Boys and Crosby, Stills & Nash. "The title of this album stands for the long road that every musician has to travel to discover his creative identity, and with that, also his audience," says Dennis. "My goal is to make records I really believe in. Because of the theatre tour, I found out how intimate a performance can be, and what kind of effect my songs have on people. The positive reactions of the audience are overwhelming." "Mainland" is the first solo effort from vocalist and postmodern crooner Joe Moe. The album is comprised of original songs, collaborations and interpretations of tunes by Moe's friends and heroes. Formally the lead singer of Southern California avant garde bands Some Philharmonic and The Native Shrubs Of The Santa Monia Mountains, Moe has worked with many notable musicians, including Van Dyke Parks (who appears on two tracks on the new album). Moe is descended from Hawaiian music royalty - grandson of pioneers Louisa and Pulu Moe, and grandnephew of Rose and Tau Moe.The Moe's introduced Hawaiian music to Europe and Asia in the early 1900s. Hawaiian traditional and pop culture string the songs on this debut solo album into a melodic lei of Cinerama scope. Similarly, the magical pull of the island homeland threads through the lives of Southern California's large Pacific-Islander community living in the shadow of that ersatz Mauna Loa, the Matterhorn. A third generation Polynesian entertainer, Joe Moe is an authentic renaissance man: musician, filmmaker, special FX artist and designer of dark-rides for international theme parks. Discover Aja Page's new song and video! What a pleasure to discover this cool fresh song by Aja Page. Richard Page's daughter starts her carreer in a very good way... Talented and natural! Frontiers Records is proud to announce the release for the second SUNSTORM album, House of Dreams. This AOR masterpiece, featuring former Rainbow, Malmsteen and Deep Purple vocalist Joe Lynn Turner, will be out in Europe on April 17, 2009. The first SUNSTORM album saw the light of day in 2006 when Turner accepted Frontiers President Serafino Perugino's concept to blow the dust off from some potential AOR hit songs that Joe wrote for the aborted follow up to his 1985 solo debut Rescue You. It turned out to be one of the most successful, straight-ahead Melodic Rock releases of 2006. Jim Peterik (ex Survivor, Pride of Lions) supplied additional tracks and the album was rounded off with some other AOR classics picked by Joe and Serafino. The stunning production, courtesy of PINK CREAM 69's studio wizard Dennis Ward, was hailed as one of the highlights and key factors to the album's success. When the second release was being planned, it was a natural choice to ask Ward to be a part of the project again. This time, he played bass and sung background vocals. He also enlisted Uwe Reitenauer and Thorsten Koehne on guitars, Chris Schmidt on drums and Gunter Werno on keyboards. Once again, Turner dug deep into the archives and found some classy Melodic Rock gems to resurrect. One of the highlights that might sound familiar to fans is I Found Love, a song that Turner often used to open up his concerts on the Rescue You tour. There's also Forever Now and Save a Place in Your Heart, where another AOR cult-hero Paul Sabu appears among the writing credits. Serafino also asked Joe to finally release "his" version of the amazing ballad Walk On, that Turner co-wrote with Desmond Child (KISS; BON JOVI etc) for the Jimmy Barnes album Freight Train Heart in 1987. Additionally, Jim Peterik was called in to offer his talents to SUNSTORM once again. The results include Tears on the Pages--- a tune co-written by Jon Lind and Russ Ballard. Peterik also contributed, Say You Will and Gutters of Gold. Brothers Tom and James Martin (HOUSE OF LORDS, KHYMERA) wrote the remaining tracks and were able to capture the spirit and quality of songs expected on the SUNSTORM project. Frontiers Records is excited to announce the European release of the long awaited new HARDLINE album entitled “Leaving the End Open” on April 17th 2009. Hardline was formed when brothers Johnny (vocals) and Joey (guitar) Gioeli, originally from the band Brunette, teamed up with guitarist Neal Schon (Journey). Signed by MCA as soon as Schon left Bad English, with the addition of Todd Jensen (David Lee Roth, Alice Cooper) on bass and Deen Castronovo (also coming from Bad English and later on with Journey) on drums, the band went on to record their debut “Double Eclipse” for MCA in 1992 and then went on the tour circuit with such heavy hitters as Van Halen and Mr. Big. Johnny and Josh Ramos started to work on new Hardline songs in 2006. With a renewed line-up now featuring Johnny Gioeli on vocals and Josh Ramos on all guitars, with Michael T. Ross on keyboards, Jamie Brown on bass and Atma Anur on drums, Hardline are now back from where they have left off producing a killer new album “Leaving The End Open”, chock full of killer guitar riffs, amazing hooklines and heartfelt ballad sealed with Gioeli’s incredible vocals and the band’s instrumental prowess. In Johnny Gioeli’s words “Leaving The End Open has a nice mix of flavors... take "Voices": it's power, it's positive feeling, it puts me in a "I can do anything mood, or "Start Again" purely radio. Everyone on this record shines!” . One thing we know about West Coast Music is that its following is much, much bigger than the name implies. It’s more like Global-Coast Music, due to the fact that diehard fans are found at every corner of the globe. At the heart of it all you find a man who continues to stoke the fires of a sound that is a sophisticated mixture of R&B, Rock, Pop and Jazz – Grammy-winning Jay Graydon. His name is found in the credits of tracks and albums that have gone gold, platinum and even multi-platinum. With long-time collaborations with friends like David Foster, George Benson, Al Jarreau, and Steely Dan, Graydon has positioned himself as one of the most creative songwriters, producers, and session guitarists on the LA scene, while continuing to pave his own road with Nashville resident and writing partner, Randy Goodrum. 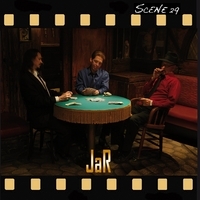 They’re the brains behind JaR, a collaboration of two of the best musical heads in the industry who have released 'Scene 29', an album that any West Coast Music fan most certainly has in their audio collection. From Airplay For The Planet to Earth, Wind & Fire’s After The Love Has Gone, Graydon has delivered just what West Coast fans have asked for over the years. Inside MusiCast welcomes Jay Graydon. Steve Lukather in Paris - "Ever changing times" Tour! Steve Lukather was in Paris on Monday 9th of march for a concert at l'Alhambra. The show satrted with "Drive a crooked road" from his first solo then follow hits such as "Fall into vevet", the Tube's "Talk to ya later", "Ever changing time", "Stab in the back" or the very emotional "Song for Jeff". Steve performed "Live for today" from "Turnback" in memory of his longtime friend and legendary guitar player David Williams who recently passed away. Just before the show, I had a short moment to talk to Steve about some musicians participating to his new record "Ever changing time". So, here's videos of Steve talkin' about Randy Goodrum, his son Trev and Bill Champlin. ENJOY!